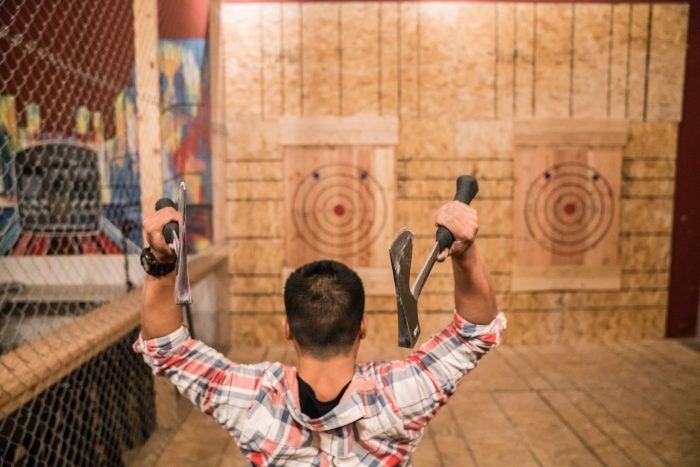 Bad Axe Throwing Chicago’s location has recently been featured in the Michigan Avenue. Writer Chuck Ansbacher raves about how Chicagoans are embracing their inner lumberjack with suspenders an all. This urban Canadian sport has taken flight after owner, Mario Zelaya, launched Bad Axe Throwing’s first location in Burlington, ON, back in 2014. With axe throwing booming across Canada it’s no wonder that our American neighbours would join in on the fun. Bad Axe Throwing opened it’s doors in Chicago, its first american location, in September 2016. With its gaining popularity Chicago has adopted this new style of recreational fun as their own and for good reason; the thrill of throwing the axe and hitting the target. Sweet victory! Bad Axe Throwing Chicago’s reputation has grown immensely over the last year and has also been featured in the Chicago Tribune, Buzzfeed and CNN. It is a great, must do, super fun time. Not only is Bad Axe Throwing an awesome place to embrace your inner lumberjack but is a great way to improve on accuracy, precision, focus and confidence. Axe Throwing Leagues are an excellent tool to exercise and strengthen these qualities. The leagues run for 7 awesome weeks where you will develop your skills and on the 8th week battle for League Championship. Chicago’s Bad Axe Throwing League has been on fire with a successful outcome leaving Monday and Tuesday nights completely booked. Spaces are filling up fast due to high volume of participants so make sure to save your spot now. If leagues aren’t your cup of tea no problem, there are other great ways to spend time in Chicago. The facility is open for birthday celebrations, bachelor/bachelorette parties, corporate events and any other special occasions. During the week Bad Axe Throwing is happy to host any event with a minimum of 8 people and on the weekends a minimum of 12 people. Book your next celebration today. World Axe Throwing League” to “World Axe Throwing League – Making axe throwing an official sport.